quite close to our house and usually my mom drove me but as I got older, I often got to ride my bike. He had a small dental office on Union Street on the upstairs level of this building that also had tenants living in the building. The waiting room was the worst part of his office because in that day and age people were allowed to smoke and there was always some smoker sitting there waiting to be called in for their appointment. Also the music that was played in the office was from WROW which was was a station that played horrible elevator music. The good thing about his office was he always had some "Highlights" magazines and I could catch up on the latest issues. When I was in elementary school and had a dentist appointment, I only saw Dr. Gilbert. There was no dental hygienist at that time that looked me over and cleaned my teeth. I suppose Dr. Gilbert did it all. I do remember he had a secretary or office manager who handled the appointments and billing but that was about it. She sat at a desk against a wall and there was always a white florescent light shining above her appointment book. She was always the one to call me in. As Dr. Gilbert worked on my teeth he would often hum to the bad elevator music that played in his office. His hum was quite nasal but I'm thinking he must have liked that kind of music. Sometimes he would even break out with the lyrics of the song but usually he was just humming along. I must have been in 4th or 5th grade when I found out I had a cavity. I was not scared to get a filling and in fact it proved to be quite an enjoyable experience. Why was it so enjoyable? Because Dr. Gilbert used Nitrous Oxide! Every time I had a cavity filled, I got nitrous oxide. I remember being in the chair and he would put the mask on me and start the nitrous oxide. What a sensation, as if I was moving futher away into a tunnel and yet there I sat. I was still aware of everything he said to me but the sensation was most enjoyable. At that time I didn't even realize the numbing shot was painful. Everyone always called Nitrous oxide, laughing gas and I couldn't understand why it was called laughing gas as I never laughed. One day, when I was probably 13 or so, I found myself at the dentist getting a cavity filled. I got some laughing gas and my mind wandered to something that struck me as funny and I started laughing. I realized then why it was called laughing gas because it was really hard to stop laughing about this dumb thing I had thought of. Ahhh...these wonderful memories of the dentist. By the time I got to high school Dr. Gilbert had hired himself a hygienist and that was the first time I had ever heard of such a thing. She was alright but I really liked Dr. Gilbert as he was friendly to me and pretty funny. Below is a picture of Dr. Gilbert. He is the man, second from the left wearing the plaid jacket. He looks just as I remember him although I remember he wore glasses at some point but probably when he was older. I was 11 years old when this picture was taken. So, why am I blogging about the dentist? Mostly because yesterday I went to the dentist and I looked around and realized how much dentistry has changed through the years. First of all I spend most of my time with the hygienist. She sets me up in a chair, gives me a bib and safety glasses and then she herself puts on gloves, a mask and safefy glasses as well. Thank you very much aids virus. I don't think Dr. Gilbert had any of this stuff on except a white or green dental jacket. I'm wondering if he wore any kind of gloves or if he just washed his hands a lot, but I just don't recall that detail and I'm thinking he didn't wear gloves when I was young. After the hygienist is done scraping away at my teeth, blowing air on them, brushing them, flossing them and then squirting water on them and sucking it up with a tube, I wait for the dentist to show up and look at my teeth. He spends about 1 minute of his time poking around and making pronouncements about my teeth while the hygienist is busily recording everything he says. Then that's it, I'm free to go. I hardly said an entire sentence to the dentist and I'm not even sure what his name was. I think it was Dr. Lee, but I only know that because they have pictures of all the workers in this Dental office and I noticed his picture and his name underneath the picture. So, gone are the days of a sink to rinse and spit into next to the dental chair. Gone are the days when the dentist does all of the cleaning, and brushing. Gone are the days of laughing gas. Gone are the days when the dentist will actually have a nice conversation with you. I should make one more comment about laughing gas. When I was in college a conversation was struck up about going to the dentist. All my friends told me how they hated the dentist. When I asked why they said, because it was painful! I remember asking them, "Didn't your dentist use laughing gas?" They all looked at me like I had corn growing out of my ears. I came to realize that most dentists did not use nitrous oxide on their patients. 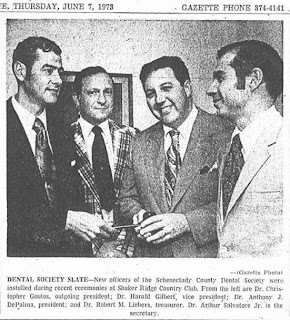 In fact, since leaving home and having to find many dentists through the years, I have yet to find one that uses it. I have come to dread going to the dentist because it mostly means pain. My appointment yesterday was the least painful in years. I got a good report except I was informed that I needed to replace 3 fillings as they were very old. So old in fact, I'm quite sure they are fillings Dr. Gilbert put in when I was a kid. I couldn't help think, soon to be gone the last physical evidence of Dr. Gilbert's workings on my teeth. The one thing I know about getting these fillings replaced; it certainly won't be as enjoyable as the first time they got filled. Three cheers for Dr. Gilbert! They tried to give me "laughing gas" once and I didn't like the way it made me feel so I took the mask off. I agree - 3 Cheers for Dr. Gilbert. The laughing gas was the best and I've never had it since.